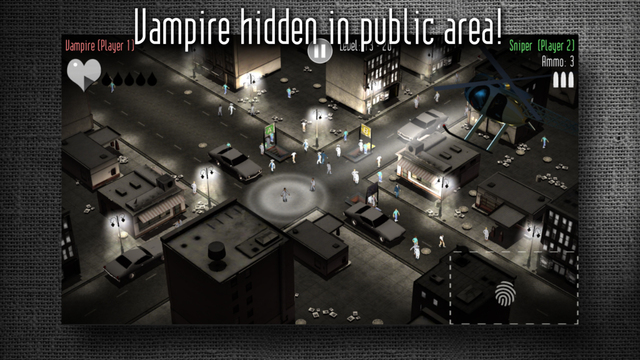 VAMPIRE HUNTING IN LA - thé local multiplayer game for iPad and iPhone 6 (+)! It’s not quite sunny in LA and that’s just how vampires like it! Police snipers are on high alert however. Dark Day LA is played by two players simultaneously on one iPad. One player assumes the role of a vampire, the other is a sniper. As the vampire, you’re walking in the streets of Los Angeles and must try to make victims without getting noticed. 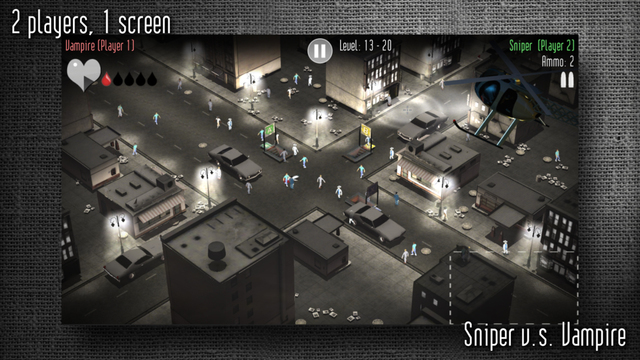 As the sniper, you’re observing the crowd and must try spot the vampire and take him out. 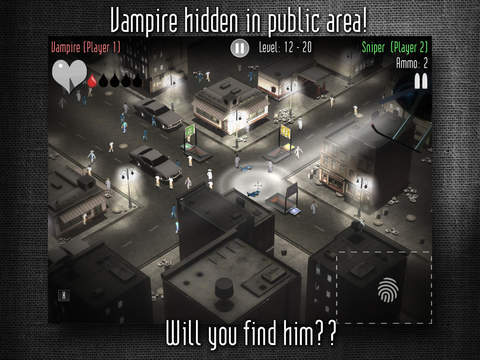 The unique controls in Dark Day LA are highly intuitive and give you very precise control over the vampire or sniper’s crosshair. Play in full screen if your opponent is sitting next to you, or use the split screen mode if you’re sitting across each other. Dark Day LA is the perfect multiplayer game and it requires nerves of steel. Are you able to deceive your opponent sitting only inches away from you? Can you spot your opponents suspicious movements before too many victims are made? Download now! * play together on one screen! * Be sure to check out the step by step tutorial. See the question mark in the game for more info! Oeps!...I guess we have been to quick releasing the previous hotfix (2.5.1) with a step by step tutorial which did resulting in a much heavier bug! 64 bit devices has been unable to play the game at all. last but not least...we absolutely understand the bad reviews as a result of the previous bug, if you could drop us some nice words here, we super appreciate this! After all, we don't get paid for building this game. It is really all about fun & passion for the job! We are continue listening to the reviews, the feedback overal,tips & suggestions. For more support, check out the Facebook page or send us an email.